Dr. Maya Shetreat-Klein is a New York-based pediatric neurologist who, through her own son's mysterious illness at one year old that caused a sudden delay his development, began to uncover the surprising roles food play in many modern childhood (and adult) ailments. More children ever than in modern history are being diagnosed with -- and medicated for -- a staggering number of behavioral, mental, and physical illnesses. From ADHD, autism, celiac disorder and more, too many children are now being most often treated for these illnesses with a myriad of pharmaceuticals, most of them which only appear to curb the symptoms of these maladies, not the root causes, and often creates new problems in the form of side effects, that will often require more medication. Dr. Maya Shetreat-Klein is a New York-based pediatric neurologist who, through her own son's mysterious illness at one year old that caused a sudden delay his development, began to uncover the surprising roles food play in many modern childhood (and adult) ailments. "During the last decade in the United States, children aged 3 to 17 with developmental disabilities increased by double digits. The incidence of conditions like autism increased by as much as 78 percent. Starting as young as two, 11 percent of school-aged kids and 20 percent of teens carry diagnoses of ADHD -- a 41 percent rise over the past decade. During the same period, the number of children medicated with stimulants or antipsychotics more than tripled. A recent study showed that in the United States, one out of every five children has been diagnosed with mental illness, costing us $247 billion a year. As if that's not enough to swear off procreating altogether, we're also seeing an unprecedented rise in cases of food allergies, eczema, asthma, inflammatory bowel disease, and other autoimmune conditions, particularly in the United States. For several years, type 1 diabetes diagnoses have increased 6.3 percent annually in children five years and younger. And so-called normal maladies like colic, chronic ear infections, poor sleep, and constipation have become all too common. (When did pooping once a week before normal?!) But most of all, why is it that no matter how educated and wealthy our society, how medically advanced, how successful at eradicating infectious diseases, our kids are only getting sicker?" According to Dr. Shetreat-Klein and dozens of other doctors and scientists cited in her comprehensive treatise The Dirt Cure, even though in theory we are eating the same foods humans have always eaten -- bread, meat, dairy, vegetables -- modern post-Industrialism food production, the introduction of pesticides, as well as genetically modified foods have made these human staples wholly unlike the foods we once ate in the past. And there is mounting evidence that these food transformations are some of the root causes of illnesses manifesting in childhood and beyond. After a great deal of trial and error, and seeking out an allergist who was willing to test her son for food allergies when others had refused, Dr. Shetreat-Klein discovered that her son was severely allergic to soy in every single one of its forms. Once she removed it from his diet, his development went right back on track as if he'd never faltered. "My son's sick body had led to a sick brain; and as his body became healthier, so did his brain... The hardest part was that no one believed that his food was affecting his health. It was that no one seemed to think he was sick at all. It was 'just some asthma,' and 'developmental delay." But what about those is normal? Somehow, when no one was paying attention, illness became the new 'normal' for children." In a way, hidden allergies are the least of our problems, because once we identify them we can move forward in eliminating those things from our diets. But what about the pesticides, preservatives, antibiotics, and other chemical poisons that are actively pumped on and into our food? In The Dirt Cure, one by one Dr. Shetreat-Klein unpacks the food and pharmaceutical industrial complexes that have turned what we eat into sometimes unrecognizable versions of themselves, and the mounting evidence of how these poisons are provoking huge rises in chronic childhood illnesses, as well as cancer and illness in adults. Some of the more enlightening discussions she draws the reader into are how preservatives are tricking us into thinking we are eating actual food, but these processed snacks and meals offer no nutrition and the preservatives contribute to even more illness. She also includes a frank discussion on the (terrifying) development of pesticides over the years -- from Agent Orange to the RoundUp that now coats the majority of vegetables we find in supermarkets -- as well as how pesticides are stored in the body, all of which are also making us sick. Dr. Shetreat-Klein's revelation regarding store-bought eggs vs. straight-from-chicken eggs was fascinating: I had no idea that eggs come with their own almost magical coating that so long as it remains, the eggs can be stored at room temperature until you're ready to eat them. The eggs we buy in the supermarket have been pressure washed, and hence why they have such a short shelf life, need to be refrigerated, and also provide less nutritional value through the process. I've never wanted to have my own chickens more in my entire life. In fact, after reading The Dirt Cure, this urban chick has started seeing herself living on a farm with crops, and hens, and a tribe of bleating goats. Throughout The Dirt Cure Dr. Shetreat-Klein asks over and over again: When did all these dysfunctions become normalized? When did it become normal to have a bowel movement only once a week? When did it become normal to pump animals full of steroids, hormones, antibiotics and feed them foods they've never eaten in the history of the animal? When did it become normal to expect food to sit on a shelf for years at a time instead of eating fresh? When did it become normal that five days worth of healthy sugar consumption are packed into one can of soda? "Two hundred years ago, we knew exactly what we were eating because we grew a good portion of the food ourselves. Then the Industrial Revolution came along and our agrarian society of self-sufficient food producers began its insidious transformation into a nation of urban consumers...As we've become less self-sufficient, we've also become sicker. Our outsourced food is produced, processed, and depleted by industry. Even 'whole foods' like meat or milk in a sense have become 'processed foods' based on how the animals were raised... Additives -- from flavoring agents to dyes to preservatives -- further stress vulnerable children in ways that aggravate or trigger chronic illness." Our fundamental relationship with food has shifted in dangerous ways, and we're seeing all the terrible side effects manifesting in our most defenseless members of society: the children. And as I turned page by page through The Dirt Cure it has never been more evident that the food and pharmaceutical industrial complexes do not have the average citizen's best interests at heart, and they have created these vicious cycles leading to illness for their own bottom line: financial profits. 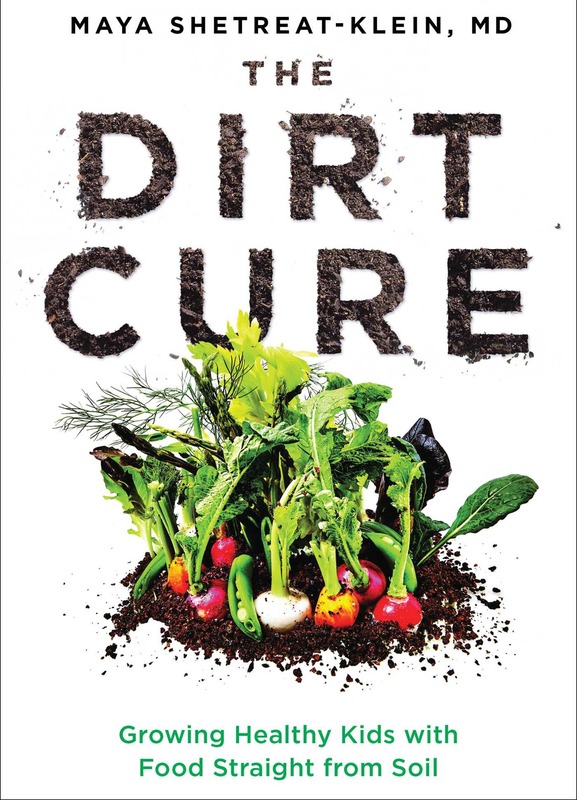 While The Dirt Cure is geared towards parents healing their children, the plethora of advice and information is applicable to everyone living in modern American society, making The Dirt Cure a must-read for anyone who cares about what goes into their, and their children's, bodies. The information is clearly laid out, and at the end of each chapter Dr. Shetreat-Klein includes a handy "Take Home" section that highlights the important information from the chapter, making it a wonderful reference tool as you work your way through the book. She also includes some delicious-sounding recipes at the end to help families transition from processed-foods and antibiotic/hormone-laden meats to a clean diet of vegetables that have come to your table straight from the dirt and meat that has been humanely treated before becoming dinner. Yes, it's extremely challenging to make serious dietary changes when we live in a society so focused on convenience, but Dr. Shetreat-Klein shows how it is indeed possible to make these changes for everyone's better health, and also why these changes are absolutely vital, not just for the environment, but for a healthy society from the ground up and inside out, especially when it comes to children. The Dirt Cure is not one of these books to passively read and shelve, it's a book to highlight, annotate, and study with its plethora of information on food and illness and so much useful advice on healing from the inside out. This is a book that should be required reading for anyone over the age of 13 living in America, and most especially parents with children suffering from illness, chronic or otherwise.